Because they have marked history, they have made us live the best memories of youth, for the pleasure of the eyes and for the wildest dreams, discover without further delay the list of manufacturers Rétromobile 2019. The British group is continuing with its efforts to restore and preserve its heritage. Jaguar and Land Rover know how to play on visitors’ sentiments. Two of the most sought-after brands in the automotive industry are once again putting the very best of their legendary history on show at Rétromobile. Jaguar is presenting a limited-series XJ220, a reminder that the brand flirted with the world of supercars at the end of the 1980s. Between the time it was announced and when it finally went on sale, this impressive 4.93 m sports coupé lost its original 12-cylinder engine in favour of a less noble 3.5 L turbocharged V6. But it could still deliver 542 hp and propel this beast of a car at speeds in excess of 340 km/h. This earned it the status of the fastest production car in the world that was approved for road use. 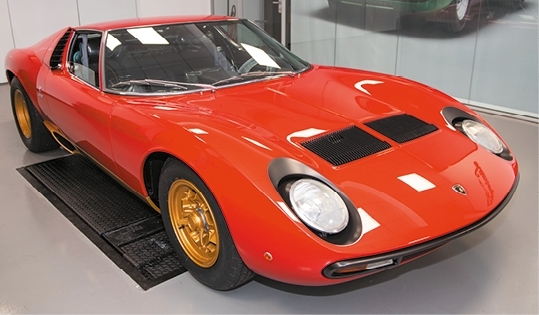 Only 271 of these supercars were ever built. Also exhibited The Type D Continuation. One of the most emblematic and beautiful racing cars of all time that counts three victories in the 24 Hours of Le Mans. For its part, the 4 x 4 brand exposes a Range Rover Classic Reborn: The Reborn program offers customers the opportunity to purchase an original Range Rover directly from Land Rover Classic UK. The car shown here is a Suffix vehicle F Masai Red from 1978, originally built for Finland. As it will be presented, the Range Rover is still being restored and will be for sale. It also features a Jaguar XE SV Project 8: The Jaguar XE SV Project 8 is at the top of performance with the power of its supercharged V8, its dynamism, agility and all-wheel drive. The Project 8 is the most powerful jaguar ever produced for road and the first to feature a 5.0L supercharged 5.0L V8. The British sports car manufacturer showcases the heritage preservation work carried out by its Newport Pagnell plant at this year’s Rétromobile. A trip to Newport Pagnell is very much a trip down memory lane. It was in this small town in south-east England, a stone’s throw from Milton Keynes, that Aston Martin thrived during the golden days of the David Brown era. 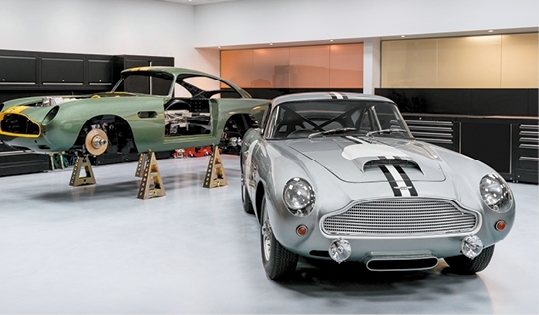 And now it’s where Aston Martin Works is located – dedicated to restoring vehicles and keeping spare parts. It’s also where leatherwork for all vehicles produced is stored and archived, and where copies of certain models that are icons of the manufacturer’s history are built, in accordance with traditional practices. In December 2017, for example, Aston Martin began building 25 copies of the DB4 GT Continuation. This project was recently followed by the sale of a series of 25 DB5s, each one identical to the one used by James Bond in Goldfinger. The most recent project is the production of 19 DB4 GT Zagato Continuation cars. These cars will be sold alongside copies of the DBS GT Zagato as part of the DBZ Century Collection. The DB4 GT Zagatos – like the DB4 GT Continuations – are not road-approved and will be exclusively for race circuit use. The Sant’Agata Bolognese’s manufacturer will be showcasing the activities of its new Polo Storico department, dedicated to preserving and promoting its heritage. For a number of years now, the Italian sports car manufacturer has been restoring its older models. Then in 2015, it created a special “Polo Storico” department dedicated to this work. Its brief is extremely wide. In addition to promoting the manufacturer’s heritage and restoring its older models – everything from the 350 GT to the Diabolo –, it also sells spare parts and offers a certification and authentication service. A further 200 parts were added to its spares catalogue in 2018. This ensures authenticity and guarantees that only original components are used. SV line. It was delivered to its French owner, two days before arriving at Porte de Versailles. A manufacturer in a class of its own which has lent credibility to France’s automotive industry, Citroën celebrates its 100th birthday this year. Rétromobile pays well-deserved homage to it, showcasing some of its flagship models – which blend creativity, genius and daring – and its sporting exploits. Nearly a hundred years ago, on 4 June 1919, the very first Citroën – a 10HP Type A – left the Quai de Javel plant in Paris. The idea behind the car came from André Citroën, born in Paris on 5 February 1878. Orphaned by his father at six years old and then by his mother when he was 21, his background was far from conventional. From a very early age, he showed exceptional talent, earning him a place at France’s prestigious École Polytechnique when he was only 16 years old. A trip to Poland was to put his enlightened mind to the test. He purchased the operating patent for a gear system the teeth of which were in an upside down V-configuration, thus inspiring him to create the double chevron logo of the Citroën brand. His Paris plant quickly flourished, and counted Skoda and Mors among its clients. salaries and enable higher numbers of people to purchase them. His predictions started to come true. Citroën became Europe’s largest car manufacturer. In 1923, he was producing 100 cars per day and 32,000 per year, while Renault and Peugeot were only producing 21,000 and 11,000, respectively. in the automotive sector. They began with the famous sponsored expeditions designed to promote the make, associating it with France’s colonial policy. Designed by Adolphe Kégresse, the Citroën B2, followed by the C4 and the C6 set off to conquer the world’s continents: the crossing of the Sahara (1922-1923), the Croisière noire (1924-1925), the Croisière jaune from Beirut to Beijing (1931-1932), and then finally the Croisière blanche in the mid-1930s. Meanwhile, this genius industrialist invented modern marketing: he used 250,000 electric lamps to light up the North face of the Eiffel Tower with his name. Nothing stood in his path. He organised parties and receptions with prodigious pomp to which the whole of Paris flocked. He was seen alongside the likes of Charlie Chaplin and Charles Lindbergh, livening up evenings at Maxim’s or frequenting gaming circles. When the Great Depression hit in 1929, the company was highly dependent on American technology – André Citroën was so fascinated by the US that he set up a design office in Detroit and a purchasing department. When demand started to fall, he had to reimburse the Fr.147 million that he had borrowed to modernise the Javel factory and tackle the puzzle of developing a new revolutionary model: the Traction Avant. The Traction Avant, French for “front-wheel drive”, was a whole new type of vehicle, engineered by André Lefèbvre and designed by Flaminio Bertoni in barely 16 months. It was prematurely launched in 1934. The company took some time to iron out a few teething problems, but the car went on to flood the streets of France for 23 years! But André Citroën would not see the car become a success under its his stewardship of the company. In February 1934, with the banks refusing to lend him more money, Michelin became its principal shareholder. Nine months later, André Citroën was forced to sell his company to the Clermont-Ferrandbased tyre manufacturer. Stripped of his responsibilities in early 1935 after the liquidation of his company, he would be seen wandering, thin and unwell, through his old factories. He died on 3 July 1935 of stomach cancer. As soon as Michelin took over, the new shareholder started implementing a major restructuring plan. In less than two years, they brought employee numbers down from 25,000 to 11,500. Salaries were reduced. Productivity increased. This was the backdrop against which design work on the “TPV”, meaning très petite voiture or “very small car” – got under way, ultimately resulting in the 2CV in 1948. This new minimalist car design, famously described as an “umbrella on four wheels”, positioned Citroën right at the forefront of innovation. But after the Liberation, under France’s five-year plan for the automotive industry, the manufacture of large cars was entrusted to Citroën, while recently-nationalised Renault was given responsibility for producing small cars. oil crisis showed just how fragile the system was. With sales driven by vehicles that were either extremely small or extremely large (the 2CV and the DS), suffering from a range that was inconsistent and a complete lack of any diesel cars, Citroën was on the cliff edge. The company was easy prey, running the risk of being swallowed up by Fiat because of an association it had entered into with it back in 1968. The French government started taking an interest in the affair, and Citroën was finally saved by Peugeot. The PSA Peugeot Citroën group was born. This marked the end of the period of “over innovation”. Throughout the 70s and 80s, Citroën had a free rein. But both entities’ employees had very different working cultures and had difficulties getting along. PSA’s purchase of Chrysler Europe did little to calm things down. The models that the make released lost their ability to surprise. Since it had stopped aspiring to revolutionise the industry, Citroën was able to improve its finances. But it was not happy simply living in Peugeot’s shadow. It was only under the chairmanship of Jean-Martin Folz, that – carried by a fully-fledged industrial policy, freed from Peugeot’s shackles and imbued with its own autonomy – Citroën was finally able to express its own personality. The numerous victories and titles secured by Sébastien Loeb in the World Rally Championships helped shore up the splendour of its rediscovered reputation. And more recently, the creation of a line of DS models and their evolution into a make in their own right have helped fashion the Citroën of the 21st-century. From the 1930 201 Torpedo to its latest E-Legend concept car, Peugeot presents numerous facets of its repertoire across the seven models it has on show. 1912. The same year, Georges Boillot won the Automobile Club of France’s Grand Prix in Dieppe at the wheel of a racing Peugeot car. Twenty laps and 77 km to cover in two days. During this period, most Peugeot cars had small and medium-sized engines. of around 70 km. Peugeot once again revolutionised the market in 1965 with its 204 saloon – a 6CV front-wheel drive car. Four years later, the 304 was launched. This medium-range saloon on show at Rétromobile is recognisable through its squared-off bodywork. Its 1.3 L engine increased output by 12 hp. Six years later, Peugeot once again created a stir by breaking onto the high-end market with its 604. This “presidential” saloon car powered by a PRV V6 engine was available in a fuel-injection Ti version. Here, it’s shown alongside a Tagora SX – a clone of it manufactured by Talbot, Chrysler’s European division bought out by PSA in 1978. To support its commitment to Formula One with its turbo-engine single seaters, Renault is gradually converting its sports models to forced induction cars. Renault is without any doubt the first volume motor manufacturer to build bridges between competition and mass-produced cars. Having introduced the turbo engine to Formula One during the 1977 season, Renault quickly developed a range of turbocharged sports cars. And in January 1980, Renault made the headlines by presenting the R5 Turbo – an R5 that featured wider rear wings, powered by a 1.4 L fourcylinder 160 hp engine. This small French car enjoyed a brilliant sports career and catalysed the design of a new generation of turbo-engined Renaults. In its wake, the R18 got a 110 hp turbo version. Then the R9-R11 got its turn with the te R5 Turbo 1 chnology. Mass rollsensation out continued with the 115 hp R5 GT Turbo. Even thehighend R25 and Alpine models got V6 turbo-compressor versions. A total of 11 vehicles at Rétromobile are evidence of Renault’s fondness for this technology, which is now back in favour to compensate for smaller engine sizes. With its aura of prestige and venerated by collectors, the Alsace-based manufacturer founded by Italian-born Ettore Bugatti has always produced exceptional machines. Bugatti, whose models feature horseshoes on their front grilles, is a make that has had several lives. The very first was built exactly 110 years ago when Ettore Bugatti decided to go it alone, founding an automobile company bearing his name in an old abandoned dyeing facility in Dorlisheim, near Molsheim. The young man was anything but a beginner. Precocious through and through, he built his first car when he was just 17. The second, hailed as the best Italian car at the 1901 Milan Fair, attracted the attention of Baron Eugene de Dietrich. It was racing that fashioned Bugatti’s image and style: simplicity and lightness driving performance. As Ferrari did some years later, Ettore Bugatti had the genius idea to sell his Grand Prix racing cars and to create luxury tourer versions for normal road usage. That’s exactly what he did with the Type 55 roadster on loan from the Mulhouse museum and on show at this year’s Rétromobile. Derived from the Type 51 Grand Prix car, the Type 55 roadster started production in 1932 and was powered by a 2.3 L straight-eight engine. After the Second World War, without its guiding lights, Bugatti lost the family company feel and eventually ceased operations. 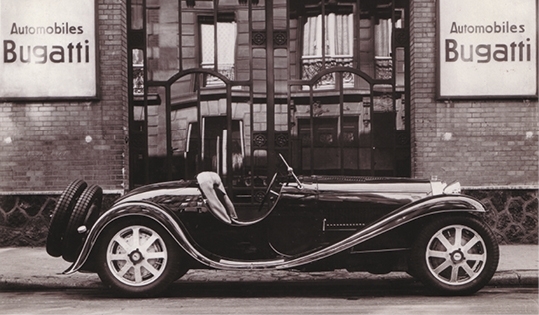 Its second lease of life began in September 1990 when a group of investors decided to resurrect the Bugatti name. Designed and built in Italy, this revival sports coupé was known as the EB110. Its technical specifications were spectacular: a carbon-fibrereinforced polymer chassis, a uadturbocharged V12 engine, 600 hp and a top speed of 314 km/h. A victim of the recession, the company eventually went into liquidation in 1995. A third chapter commenced in 1998 under the ownership of the Volkswagen group. Making another appearance at Rétromobile, the Munichbased car manufacturer is presenting a number of flagship models from its 100-year-long history, reminding us that it has long been committed to safeguarding its heritage. BMW’s Classic branch is a museum, a restoration workshop and a spare parts maker. It also takes part in events all over the world – evidence of just how lively a branch it is. Its return to Rétromobile has not gone unnoticed: it has brought with it no fewer than nine vehicles, including an R51/3 motorcycle. A reminder that it built motorcycles before establishing a foothold in the automotive sector. Its car production aspirations became reality at the end of 1925. Over the years, it has become one of the world’s leading sports car builders, giving birth to numerous coveted vehicles. 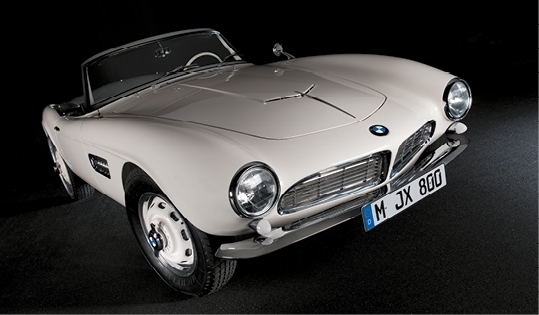 In 1955, for example, it launched its majestic 507 roadster. Designed by Albrecht Graf Goertz around a 150 hp V8 engine, only 262 of these luxury tourers were built. BMW would return to roadsters in 1987 with its completely original Z1. This car was a major milestone with its vertically sliding doors which dropped down completely into the door sills. BMW has not forgotten that it owes a great deal of its prestige to its relationship with motorsports. At this year’s Rétromobile, BMW is celebrating the 40th birthday of the Procar series – a one-make Group 4 M1 race that is held at the start of the European Grand Prix races. During the same period, the manufacturer will be livening up the packs of group 5 races with a bodybuilt 320. A model of this fascinating disguised prototype is on show at this year’s Rétromobile. These legendary cars can be seen alongside their descendants in Paris. Popularised by the repeated wins of the Bentley Boys during the Roaring Twenties, Bentley has been producing luxury sports cars for a hundred years. between 1924 and 1930 (four times in a row between 1927 and 1930). For Walter Owen Bentley, the founder of the car manufacturer that would later bear his name, competition was the best way to publicise his creations. turned his attention to cars. He became a sales rep for a company that sold French DFP cars just before the First World War broke out. Commissioned in the Royal Navy Air Service, he put his engineering knowledge and expertise to good use. In early 1919, he founded Bentley Motors Ltd and built his first car in record time. This 3 L engine Bentley put the cat among the pigeons: it had four valves per cylinder, a crossflow cylinder head, an overhead camshaft and two spark plugs per cylinder. The 3 L car was not just fast. It was reliable. It proved itself in races. It won event after event, at a time when cars were delivering more and more power. In 1924, the first six-cylinder engine pushed the displacement up to 6.5 L. Bentley started building increasingly fast and more powerful models: the 4.5 L in 1927, followed by the Speed-Six in 1928… then the supercharged 4.5 L in 1929 and the 8 L in 1930. W.O. also had the best racing drivers. Nicknamed the Bentley Boys, this team of motoring enthusiasts included Woolf Barnato, whose family had made their fortune in diamonds and who became Bentley’s main shareholder and chairman. The Great Depression that began in 1929 weakened the company. It was acquired by Rolls-Royce in 1931. In 1935, W.O. left to join Lagonda. Over time, Bentleys became Rolls-Royce variants. With coachwork by Mulliner & Co., the R-Type Continental coupé was produced between 1952 and 1955. A masterpiece of elegance and refinement. Since 1998, Bentley has been part of the Volkswagen group. In 2003, the prototype Bentley EXP Speed 8 won its sixth 24 Hours of Le Mans. The victory was celebrated at the Savoy Hotel in London – just like in the W.O.Bentley 1930s. To mark its 70th anniversary, our Abarth brand is spotlighting its role in the design of some of the Italian group’s legendary models. What do the 1955 Alfa Romeo 750 Competizione, the 1958 Fiat 500 “Record”, the 1960 Abarth 1000 Monoposto da Record and the 1982 Lancia Rally 037 have in common? All four historic Italian cars benefited from the expertise of the Abarth workshops founded in Turin in 1949 by Austrian automobile designer Carlo Abarth. From the start, Abarth - which retains its original logo: a scorpion on a red and yellow background - focused on the design and rally entry of racing cars, as well as the production of accessories to improve the performance of mass-produced vehicles. Abarth diversified its business and soon began developing cars for other prestigious brands. 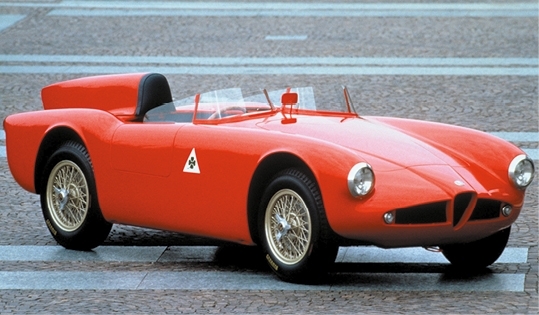 Alfa Romeo, for example, entrusted it with the manufacture of two 750 Competizione chassis. This racing Spider is powered by a 145 hp 1.5-litre twin-cam engine. Abarth began production in 1950 and went on to break a string of speed records with its unique and highly aerodynamic models. In 1971, Abarth was sold and became the racing department for Fiat, developing the 037 Rally that won Lancia the 1983 World Rally Championship. The FCA stand will also feature a 1981 Fiat Pininfarina Spider Europa restored and put on sale as part of the «Reloaded by creator» program launched last year. The world’s leading engine manufacturer, Honda hit the headlines in 1999 by launching a hot-headed roadster that handled like a motorbike. the world record for the highest specific output for a normally aspirated production automobile engine. The VTEC variable-distribution engine was a masterpiece. More compact and lighter than the 2 L engine that featured in the Honda Prelude sports coupé, it made use of a number of technologies borrowed from Formula 1 – particularly its forged aluminium pistons, light valve springs, roller-type rocker arm, carbon fibre and alumina reinforced cylinder block, forged carbon steel castings, direct air intake system and a high compression ratio of 11:1. 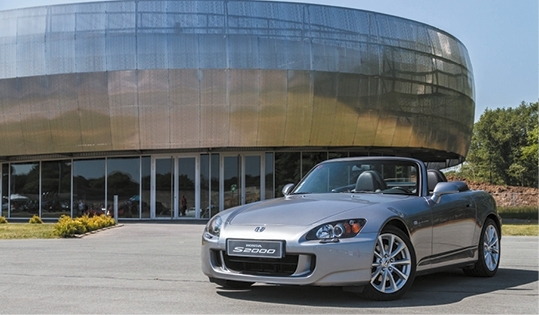 In 1999, this rear-wheel-drive roadster helped toast Honda’s on its 50th birthday.